Happy Monday and it’s back to work time at That Business Show with Jamie Meloni following this great Easter weekend break. 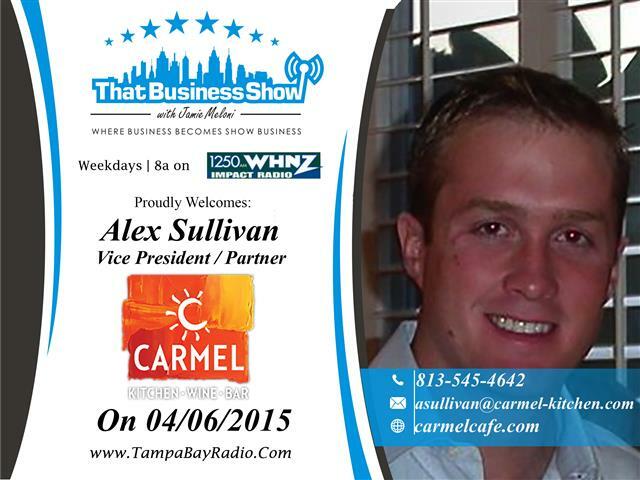 My first guest on today’s show was Alex Sullivan, Vice President and Owner of Carmel Kitchen, a restaurant and wine bar with multiple locations in and around the Tampa Bay Region. Carmel Kitchen is a great South Tampa restaurant choice that takes Mediterranean cuisine and pairs it meticulously with a great wine choice or cocktail and they have many experts on staff that can share with you some of the finer points of the wine choices they have for selection. Alex speaks of his path through entrepreneurship going from Real Estate broker to restaurant owner and the challenges and joys of being in this space. Learn more about this unique restaurant and brand at http://www.carmel-kitchen.com and there you can also get information on their rewards program – Club Carmel, so be sure to check that option out as well. Carmel Kitchen has 6 locations around the Bay area with a 7th one shortly and you can find all their different location on their website, http://www.carmel-kitchen.com! On the 2nd half of the show, I welcomed Pure Barre franchise owner Lauren McComb in studio. Lauren transitioned from the field of financial advising into business ownership several years back and has grown the franchise from 1 to 4 locations now along with her mother. Lauren talks about the Pure Barre technique on this show, a low impact but results oriented workout that focuses on muscle stretching techniques and infuses many of the techniques from ballet into the work out as well. Lauren believes Pure Barre is the ultimate full-body workout that not only provides outstanding results, but makes working out more enjoyable and fulfilling. Lauren has seen Pure Barre transform her body and elongate her muscles giving her the results she has always wanted. Locations can be found around the Bay area including Bradenton, Clearwater, St. Petersburg and South Tampa and they offer fun workout classes for many occasions. Learn more at http://www.purebarre.com or contact Lauren directly at 941-350-5991 or email at laurenm@purebarre.com for more information!